Welcome to the seventeenth issue of the Columbia College Class of 1963 eNewsletter. Because I got the June issue out so late, I really had nothing new to report last month so I skipped the July issue. (It's Summertime, and the living is easy.) Still pretty quiet around here, so I'm assuming that many of you are in the same boat, and are enjoying a well deserved vacation. As you know we skip our monthly class lunches in August, but I will report below on our last gathering of the summer on July 13. Please join your classmates for an informal lunch at the Columbia Club every second Thursday of the month. It is our hope that these gatherings will renew old friendships and foster improved relationship with our class and the College. This month, Thursday, September 14, 2006. The eighteenth Second Thursday Class of 1963 lunch was held on July 13. Several regulars, Doron Gopstein, Bob Heller, Paul Neshamkin, Tom O'Connor, Barry Reiss and Walter Stein were joined by Ben Tua, who came up from Washington, D.C. Two members of the Class of 1964 asked if they could share our table, as they had had very few show up for their Second Thursday lunch, so we were joined by Norman Olch and Fred Kantor. A fabulous group as always. 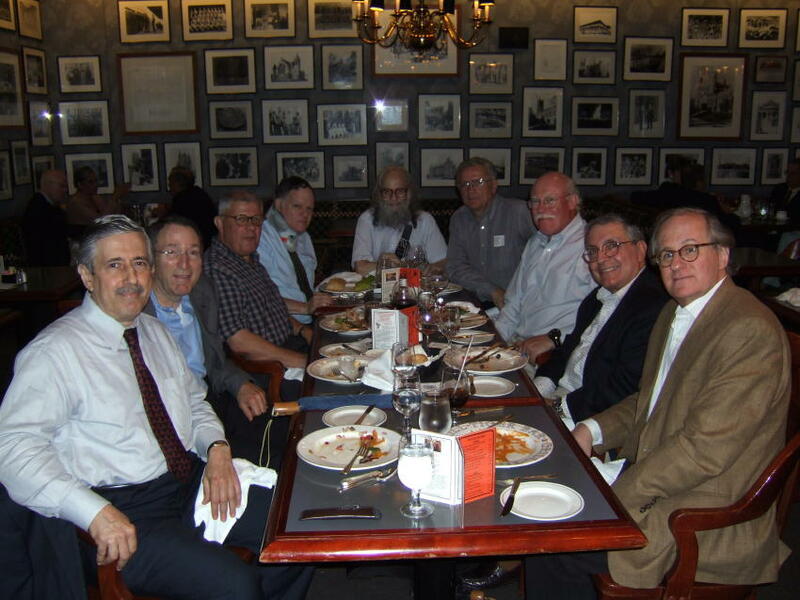 (From left to right): Doron Gopstein, Bob Heller, Ben Tua, Walter Stein, Fred Kantor '64, Tom O'Connor, Paul Neshamkin, Barry Reiss and Norman Olch '64. I hope you can all join us (please encourage your friends to come with you) at the next lunch on Thursday, September 14. This will be a unique time to meet Derek Wittner '65, Dean of Alumni Affairs and Development; Susan Birnbaum, Executive Director, Columbia College Fund; and Karri Brady, the Columbia College Fund Director recently assigned to our class. Let me know if you will attend so that we can reserve a big enough table; RSVP to Paul Neshamkin (pauln@helpauthors.com). A very quiet summer so far. Here is all the news that you've sent in or that I could dig up. I just received a lovely, long letter from Barry Landau, my suite mate in New Hall our Freshman year. Barry is in private practice of adult, child and adolescent psychiatry, psychotherapy and psychoanalysis in Washington, D.C. He is a training and supervising analyst at the Baltimore-Washington Institute of Psychoanalysis and a Clinical Professor at George Washington University Medical Center, the Children's Hospital National Medical Center, and is a Civilian Consultant and Psychotherapy Supervisor at Walter Reed Army Medical Center. Barry has been married to his wife, Sara, an elementary school teacher, for almost forty-one years. Their oldest child, Rebecca, and her husband, Anthony Millin live with their two children in Tenafly, N.J. Rebecca is a psychologist who practices in a group practice in Short Hills, N.J. Barry's younger child, Joseph, is a lawyer, on leave of absence form Cleary, Gottleib in New York. He is clerking for a year for a Federal Appeals Court Judge in the Ninth Circuit and living in Seattle. Barry writes, "I remember the years at Columbia with great fondness and warmth. My mind was opened intellectually, personally and socially. It was a time that I will always cherish." Well said, Barry. I hope you can make it to one of our class lunches in the fall, it would be great to see you again. Larry Newman missed the last lunch because of a business trip to China. He emailed me, "Shanghai is like New York on steroids. Business is going well, but the air is hot and thick enough to cut with chopsticks – Inner Mongolia should be cooler." Joe Fisher just called me up to see who is going to Homecoming. He's planning on coming up from Alexandra, VA. I certainly will be there. I hope many of you will make the trip back this year. The Homecoming Game is on Saturday, September 30 against Princeton. The pre-game picnic in the Big Tent at Baker Field starts at 11:00 AM. Let me know if I'll see you there.